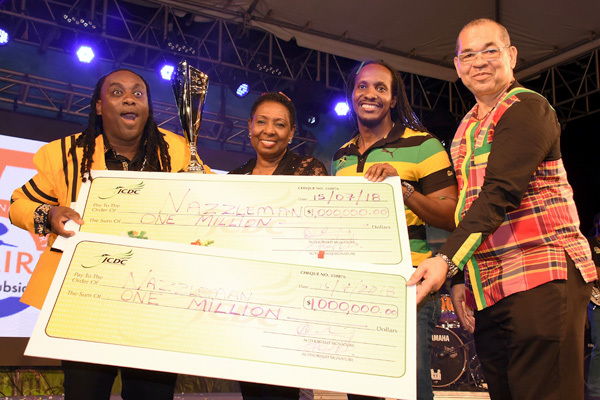 JAMAICA A WI HOME: Winner of the 2018 Jamaica Festival Song Competition, Oneil “Nazzleman” Scott (left) receives the winning trophy and two cheques for $1 million each for Winning Song and Writer of the Winning Song for his song Jamaica A Wi Home from Olivia Grange, Minister of Culture, Gender, Entertainment and Sport (Centre), Alando Terrelonge, State Minister in the Ministry of Culture, Gender, Entertainment and Sport (second right) and Orville Hill, Interim Executive Director of the Jamaica Cultural Development Commission (right) at the competition’s grand final, held at the Ranny Williams Entertainment Centre on Sunday, July 15. Nazzleman returned with a bang to capture the 2018 Festival song title with his song: ‘Jamaica A Wi Home’ at the Ranny Williams Entertainment Centre in Kingston on Sunday July 15. Nazzleman took home over 2 million in cash and prizes. In addition to a trophy for the winning song, Nazzleman also received a $1 million cash award for the Winning Song, a $1 million cash award for Writer of the Winning Song and a $300,000 cash award for Best Vocalist. The Escarpment Road New Testament Church of God (ERNTCOG) Choir were the other winners in the Competition as the 63 member mass choir walked away with the other two sectional prizes: Best Performer which has a cash award of $300,000 and Most Popular on Social Media with a $200,000 cash prize. In addition, all of the finalists also received a cash award of $150 000 each for participation, in keeping with the Bigger and Better prize purse for 2018. The exuberant winner, Nazzleman is no stranger to the Jamaica Festival Song Competition as he not only won the title at the competition’s last staging in 2016 with his song “No Weh like Jamaica”, but he was also previously a two-time finalist, placing third in 2012 and second in 2015. Culture Minister Olivia Grange said the competition was excellent this year. “The 2018 Festival Song journey has been an exciting one and the grand final was even grander than I expected. All of the finalists’ Festival Songs are winners and each had the audience singing and cheering along, but at the end of the day I agree with the judges, ‘Jamaica A Wi Home’ is the perfect song to be the background for the Jamaica 56 Independence Festival,” Miss Grange said.